Labor market reforms - deregulation or lower taxation? I have briefly observed that instead of wading into the controversial hire-and-fire reforms, the next round of labor market reforms should involve addressing the dual price market in labor wages. The fundamental problem is that Indian manufacturing firms start and remain small and informal. This engenders an inefficient equilibrium of low productivity, low wages, deficient social protections, limited investments, and stunted growth. What is required to break out of this equilibrium? The likes of Arvind Panagariya argue that the restrictive hire and fire policies encourage firms to start small and informal and remain so. There is another possibility, as highlighted by Manish Sabharwal, that the high rate of labor taxation, payable by both employers and employees (upto 45% of wages are deducted for pensions and insurance for those with smaller incomes, whereas just over 5% of wages are deducted from those with higher wages), encourages much the same as above. It is certain that both - restrictive labor regulations and high rate of labor taxation - contribute to keeping firms small and informal. What is not certain is which is a greater constraint facing firms. In this context, I have argued in detail that restrictive regulations may not be as binding a constraint as prohibitive taxation rates are. Consider this story. If you are the typical entrepreneur starting a textile unit, you are more likely to start small and not be able to afford higher salaries. However, at such salaries, you are also unlikely to be able to attract workers, especially given the prohibitively high payroll deductions. So the firm prefers to either start informal or contract labor. Once it starts informal, it gets entrapped in a low-level equilibrium, exiting from which is constrained by several factors, including informality itself as well as restrictive labor regulations. A more prudent strategy involving labor market reforms would revolve around lowering mandatory payroll deductions and replacing it with publicly funded social protection that is programmed for a gradual phase out. Should You Invest in the Equity Mutual Funds Now? If you have been avoiding equity Mutual Fund all these years, don’t plunge into the market or Equity Funds too enthusiastically. As the stock market surges to new highs, ordinary investors who missed a lot of the rise have been rushing to jump on board. It's easy to see why. Most people find it very hard to resist a crowd. it can seem like everybody is making easy money except you. Is it too late to get in on the action? What's the best strategy if you're holding all your money in cash, money-market (Liquid Funds), FMP'S (certificates of deposit) or other "safe," stable and profitless investments? "Be fearful when others are greedy, and greedy when others are fearful," advises Warren Buffett, the most successful investor in history. His meaning: The market is never so dangerous as when everyone else is optimistic and share prices have already risen a long way. Indeed, historically, you could have made money by investing in stocks when the public was selling, and selling only when the public was buying. Shares or Equity Mutual Funds can prove a poor investment over one, two or even three years. Historically, the risks of investing in the market have declined the longer one invests. Strategists usually advise that you invest in stocks only with money you don't expect to need for four or five years. If share prices go up during that time, you'll have the psychological cushion of some paper profits to show for your initial investments as you commit more money. If share prices go down, on the other hand, you'll have the relief that you didn't commit too much money at higher prices. In simple words its rupee cost averaging.We Normally call it as SIP. It is a beginner's mistake to put too much money into the stocks or assets that have already risen the most. During a boom, that typically includes the most volatile assets, such as small-cap stocks and the stocks of companies hoping for the most growth. Those are the assets most vulnerable to a pullback. Investors can reduce the dangers by committing in advance to a balanced portfolio that includes less-volatile assets, such as government bond funds OR Income funds, which offset high-volatility stocks. During every boom there are always some who lose sight of what a stock really is. They talk about "beta," "growth stories" and "blue sky valuations," forgetting that a stock is simply a claim on a company's future cash flows. They also are particularly good investments during stock-market downturns and recessions. I strongly believe to own funds instead of Stocks as stock picking will be done with professional approach. Focusing your investments too much on your home country's market is a common beginner's mistake. Professional money managers often go along with this in order to get along. But it has no justification in theory or practice. You can lower your risk by investing in global stock funds rather than in the home country's giving yourself adequate exposure to developed overseas markets and so-called emerging markets. offer documents carefully before investing. how much and why should you buy Life Insurance? Life insurance is a very important aspect of financial planning but unfortunately investors are not very clear with primary objective of buying life insurance and how much life insurance they should buy? This article is an effort to bring clarity on these two topics. Normally most of the life insurance policies are bought between January to March, Do you know why? For a simple reason to save taxes. So most of the times investors buy life insurance policies for tax saving and normally insurance consultant is relative or friend and buying policy is an obligation. In India policies are bought with a primary objective of investment and tax saving and due to this people end up paying high premiums, for very low amount of life insurance cover. This is where investors are making serious mistake. This mistake hurts investors in two ways, which is as under. They are normally under insured even though they are paying high premiums. Due to high life insurance premium which is invested at very low returns their wealth creation process is negatively affected. In my coming articles I will try to quantify the amount of wealth destruction due to this approach. Life insurance should be bought primarily with objective of life insurance because logically whenever there is death of bread winner, family suffers with two types of losses. One is emotional loss due to death of a family member and second is financial loss due to death of the earning member. When we buy life insurance we transfer this risk of financial loss to Life Insurance Company. Life insurance is primarily needed to replace the income of the earning member of the family who has died. So whenever you are buying a life insurance your primary objective should be maximum risk coverage at low premium and not investment or tax saving. Don’t buy Life Insurance in the name of Non-Earning members of the family. Also don’t buy life insurance policies in the name of non earning members like wife or children because their death will not cause you any financial loss. On the contrary if you buy life insurance of non earning family members, paying premium will become a burden for them in case if the earning member dies and regular income of family stops. How to calculate how much Life Insurance you need? It is a very common question asked by investors- how much life insurance I should buy? Once you are clear with the objective of buying life insurance, next step is how much life insurance one should have? There are different approaches to calculate how much life insurance you need and all approaches have different answers but the prudent approach to calculate how much life insurance one should buy is Needs Approach. Needs Approach: Needs approach is a method of calculating how much life insurance is required by an individual to cover family needs (all type of expenses and liabilities). It is basically function of following three. Present Value of money required to run household expenses in absence of regular income of bread winner. Total of present value of money required to meet all big future expenses (like higher education of children, marriages of children etc.). Out of the total of above three we have to subtract sum total of current life insurance and current assets available for use. The figure that is arrived is the insurance need of an individual. So this is how one should calculate his life insurance. Let us see one example of a family to understand with more clarity. (*) Here present value is the amount received as insurance claim, in case Mr. A dies. This amount if invested at 8% p.a., will become goal value in the goal year. Now in above case it is clearly visible that Mr. A is bread winner and he requires a life insurance of around Rs. 1.70 crores. Now next question is which insurance policy he should buy. It is advisable to buy term insurance policy. In above calculation you may see that we have taken credit of existing life insurance and any other additional financial or other assets which are not for consumption and are mainly available for these goals. So as these assets grow, the need for life insurance reduces. If in above case the person has additional assets of say 1 crore available to consume for goals then his life insurance need will be less by 1 crore. So with the growth of assets the life insurance needs will fall. In practical life people take more life insurance as their assets grow which is a wrong approach. Conclusion: It is very important to understand and calculate how much life insurance one requires, because without that you may either get under insured or over insured. Under insurance is very dangerous and over insurance may add additional cost to your budget which is not required. I would suggest investors to be very clear on their life insurance needs as it is an important part of comprehensive financial planning. It served as a poignant reminder of the inevitability of what is a dreaded word for many - retirement. Indeed, the growing life expectancy in the country poses a challenge - of managing the risk of living long, particularly in a society that is increasingly moving away from the financially secure confines of the joint family system. However, coming-to-terms can be relatively easy when you have planned for it meticulously during your earning years. In fact, a well-charted retirement process can even act as a springboard for a brighter future, besides ensuring peace of mind. All you need to do is to save and invest wisely to build a handy sunset-years kitty. Be it creating a corpus through equity, mutual funds and fixed deposits or buying a pension plan. In case of the latter, you will have to undertake the vital task of buying annuities, when the accumulated amount is handed over to you. Annuity-buying process gains significance particularly in light of new Irda guidelines on pension plans which have heralded several changes. Under the new regime, among other things, policyholders will not have the choice of approaching the insurer which offers the best annuity rates at the time of vesting. This has been done to reduce the burden on PSU behemoth LIC, which rules the space at present. This makes it imperative for them to choose wisely while buying a pension plan itself, factoring in the insurer's capabilities. "A full provider evaluation does become an important factor to be considered upfront when buying a pension plan. In addition, track record in managing the corpus, charges and fees, transaction convenience, payout history, etc, become important to evaluate," While rates are important, your decision cannot be based solely on the ones being offered at present. "Do note that the annuity rate at the time of buying a pension plan need not be an indicator of what you would get when you need to buy annuities in future." So far, nearly 29 products have been filed with the insurance regulator for approval since the new norms became effective from January 1, 2012. Last week saw the launch of MetLife's deferred annuity, or pension, plan. Also, SBI Life launched an immediate annuity scheme. Annuities refer to the stream of income an insurer pays at regular intervals until your death or the end of tenure you may have opted for. The corpus at the end of the accumulation phase will be paid out in two parts - 1/3rd in the form of lumpsum, with the remaining being converted into annuities. Now, you need to 'buy' annuities using the amount accumulated by your pension plan or any cash lump-sum. And the annuity option you choose would depend on your requirements and expectations from the plans. This would be applicable primarily to those who may have built the corpus through pension plans until January this year and others with a fund pool. As mentioned earlier, those buying pension plans henceforth will have to settle for the annuities offered by their insurer. Within the basket of annuity plans offered by your insurer, though, you still have to use your discretion. This would be applicable to everyone looking to buy annuities - irrespective of the date of purchase. "While zeroing in on the right option, you need to ponder upon three questions - what kind of income you would require, whether your annuity requirement would go up or remain the same throughout your life-time and whether you would like to redirect the proceeds to your spouse upon your death," says Pujari of SBI Life. Adds Kapoor of StanChart: "Customers should look at the expected rate of return (annuity rate) net of charges, the period of annuity desired (whether for life, or for a fixed period), flexibility in joint ownership and payout while buying annuities." After an evaluation of your requirements, you can get down to the business of choosing an annuity option that fits your need best. Broadly, annuity plans are categorised into five segments although the range of options could vary as per the insurer. ANNUITY PAYABLE FOR LIFE: The annuitant is paid a fixed annuity at regular intervals throughout his life. The insurer stops paying pension after the annuitant's death. This is suitable for those who do not have any obligation post death. This option offers the highest amount of pension for an individual compared to any other options available. ANNUITY PAYABLE FOR LIFE WITH A GUARANTEED PERIOD: Here, annuity is paid for certain number years, (say the chosen term of 10 years) and thereafter as long as the annuitant is alive. Shorter the guarantee period, higher is the pension. Annuity stops upon either the death of the annuitant or completion of the guaranteed period, whichever is later. This is a simpler tool to ensure income for the family for a stipulated period of time. For example, say the annuitant retires at a time when s/he is still the sole earning member in the family, but expects the kids to take over after five years; such individuals can look at annuity that is guaranteed for five years. LIFE ANNUITY WITH RETURN OF PURCHASE PRICE: This option could work for those who want to leave alegacy for their nominees to inherit. Here, the annuitant enjoys the pension till s/he dies. After the death of the annuitant, the purchase price of the annuity (that is, the premium paid by the buyer of the annuity) is handed over to the nominee. This is a popular option as both the annuitant and the nominee stand benefited. Some new variants also offer to get the purchase price back in parts. LIFE ANNUITY INCREASING AT A FIXED RATE : Under this option, there is an increase in the annuity amount payable per year at a certain rate, say of 3-5%. "While it is not linked to the actual inflation rate, the rationale is that it would take care of the increase in expenses to an extent," says Pujari. JOINT LIFE AND LAST SURVIVOR ANNUITY: As the name denotes, annuitant is entitled to receive the pension throughout his lifetime. If the spouse survives the annuitant, the former is also entitled for the pension, ensuring 'life-style maintenance' of the spouse. The buyer can further choose the quantum of pension (50% or 100% of the annuity payable to annuitant) payable to the spouse. The advantages notwithstanding, you would do well to refrain from putting all your eggs in the annuity nest. "Annuity income is taxable. Therefore, while buying one, you should ensure that your annual income from annuity is within the 'no-tax' limits," says Lovaii Navlakhi, managing director and chief financial planner, International Money Matters. Besides, you can also consider other tax-efficient avenues such as shortterm debt mutual funds or tax-free bonds. "Annuity income is fixed, and if the interest rates move up, you may not get to participate in it. That makes it all the more important to ensure that you portfolio gets some exposure to instruments that are liquid," adds Navlakhi. In other words, you would be in a secure position if you have allocated your savings amongst a mix of products that complement each other. Remember, while retirement is seldom thought to spell happiness, a carefully planned one will ensure you close your professional innings with your head held high. 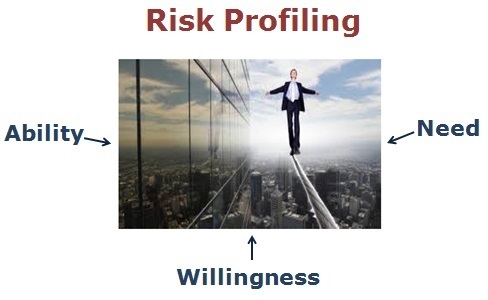 What is Risk Profiling and why you must do it? Normally I have seen that when it comes to investing in different asset classes,every investor is confused about how much should I invest in asset classes like Equity where the risk is high and how much should I invest in asset classes like Bonds where the risk level is low and most of the times the clients who come to me for their financial planning are either under invested or over invested in aggressive asset class like Equity. There are very few investors who have ideal allocation in all Asset Classes. Deciding how much allocation should be taken in which asset class depends upon investor’s Risk appetite and his risk appetite is decided by doing his Risk Profiling. So this article is an effort to explain what is Risk Profiling and different factors on which Risk profiling of an investor depends. Age: One of the major factors in deciding risk taking ability is age. Normally higher the age, lower the ability to take risk. But this is not always true. Let me give you an example to explain this. Recently I was writing financial plan for a young doctor who just completed his Post graduation and about to start his working life. He has financial objectives which are very short term like marriage, buying a house and planning for his clinic. So all these objectives are very short term and so we cannot invest much money for long term and cannot take much exposure in Equity kind of asset classes. Investment Horizon: Investment horizon plays major role in deciding risk taking capacity of an investor. Say if an investor is investing for 15 years then he has long term period so he can take higher exposure to aggressive asset classes like equity and real estate. But if he is investing for 2 years only then he has limited time so he should not invest in risky asset classes and his risk taking capacity is low. Longer the investment horizon, higher the risk taking ability and lower the investment horizon, lower the risk taking ability. In above illustration Mr. A and MR. B have same goal. They have a 5 years old kid and education fund required in today’s value is Rs. 2000000/- and fund will be required at 18 years of age. Inflation is assumed to be 8%. Final goal value is around Rs. 54.39 lacs to be achieved. I have purposefully kept all the factors same for better understanding. Now look at below table. In above case both Mr. A and Mr. B have same goal value but Mr. A has already provided Rs. 17 lacs for above goal and Mr. B has provided only Rs. 12 lacs. So for remaining period of 13 years Mr. A can easily achieve the goal only by investing this fund of Rs. 17 lacks at 9% p.a. returns which is quite easy to achieve and can be achieved with very low equity allocation say by investing between 10% to 20% in Equity and rest in Bonds. Where as for Mr. B to achieve this goal by investing this fund of Rs. 12 lacs, he will have to invest at 12% p.a. and for this he will have to take high risk and invest more than 50% in Equity. So in his case need to take risk is high. Risk profiling is the process of deciding an optimum risk level that an Individual Investor should take in his investments. 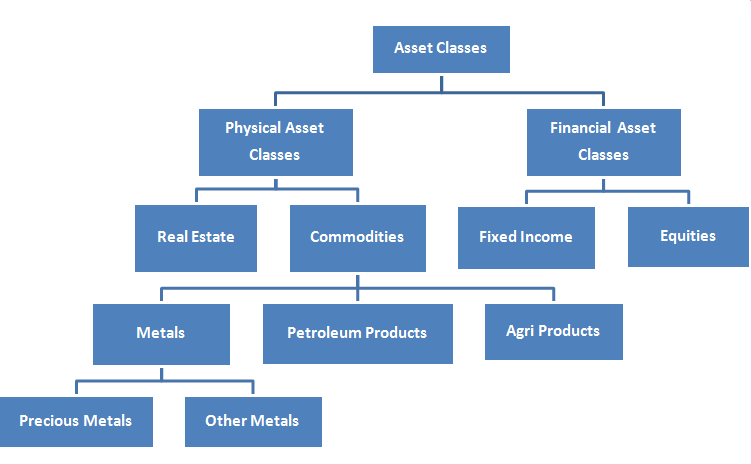 As shown in above picture Asset classes are divided in to two segments, Physical and Financial asset classes. Within Financial asset classes you have two options: – Equity and Fixed Income and in Physical asset classes you have Real Estate and commodities. 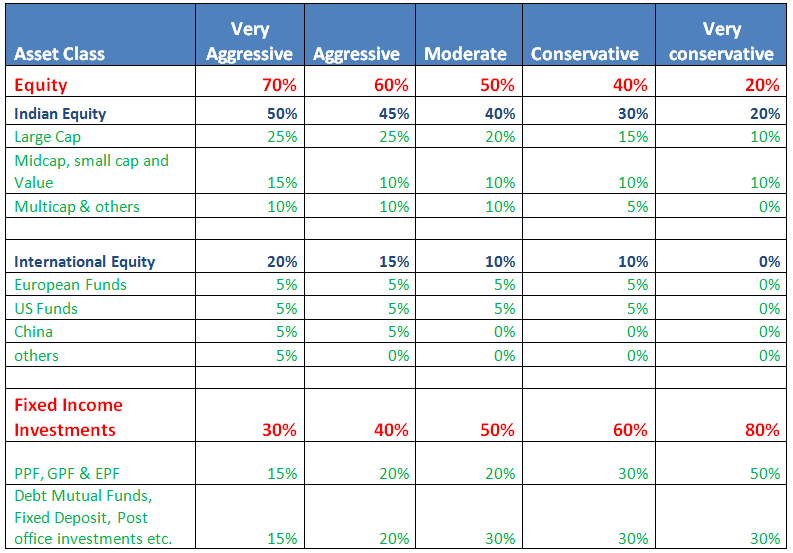 Now every investor has to decide an optimum mix of these asset classes for himself. For deciding his optimum risk level, investor has to decide his risk appetite and for this he has to do his risk profiling. The risk level that an individual investor should take depends upon three major factors which are as under. 1.Capacity to Take Risk: This depends upon risk taking capacity of an investor depending upon his circumstances. For example, an investor who is 35 years old generally has higher ability to take risk than an investor who is 75 years old. While deciding ones risk taking capacity there are numbers of factor which needs to be considered. Here below I have mentioned a few of them. Other factors that contribute in deciding risk taking ability are type of income, health conditions, number of dependents in a family etc. 2.Need to Take Risk: Need to take risk is another financial character that decides optimum risk level for an investor. Let me explain you Need to take Risk with an illustration to make it simple. There are two investors Mr. A and Mr. B. To simplify further in case of an investor who has lots of accumulated wealth compared to his financial goals, need to take risk is low so logically he should take less risk and allocate less money in high risk asset classes like equity and investor who has relatively low accumulated wealth against his financial goals has need to take high risk and so he should logically allocate more money to risky asset classes like Equity. 3.Willingness to take Risk: Capacity to take Risk and Need to take risk are two financial characteristics of the investor where as Willingness to take Risk is a psychological character of an investor’s risk profiling. Willingness to take risk is basically investor’s psychological comfort level with the risk. Psychological comfort level means how comfortable are you with volatility in underlying asset class in which you are investing. If you have invested 50% of your assets in Equities and equity market falls by 20% your equity assets can easily fall by 20% or even more than that and your total portfolio can also fall by around 10%. Are you comfortable with this fall or volatility psychologically? If you feel disturbed and cannot sleep in the night or cannot focus upon your work than you have chosen higher risk level than you ideally should and you should lower down your equity allocation. How to improve your Psychological comfort level with different Asset Classes: I would like to share my experience as Practicing Financial Planner here. When investors come to me for their financial planning, I realize that their understanding about basic financial concepts is very poor because in India we don’t have any formal education on personal finance in any education streams like Engineering, Medicine etc. so due to poor understanding about basics they are afraid of taking risk. So first of all I try to develop a basic understanding about asset classes and try to explain them basic things about asset classes, investment, their characteristics and then make them understand about what is risk? And how to manage risk. Once this understanding is developed they are comfortable with risk and after that we decide upon clients comfortable risk level. Willingness to take risk should not change with market conditions: Many times, I have observed that in the times when Equity markets are doing very good, investors invest major part of their wealth in Equity and when equity market fall they reduce their allocation to equity and divert towards other asset classes which are doing good at that time. So this shows that willingness of investors keep changing with sentiments. This is very dangerous factor and every investor should be cautious about this and see that your willingness should not change as per your sentiments because this will affect your investment decisions adversely. Many financial planners use some psychometric test questioners to measure willingness of investors to take risk but I am of opinion that those questioners don’t take you to right conclusion. From the above three factors, Capacity, Need and Willingness to take risk, optimum risk level of the client is decided and accordingly his investments are allocated to different asset classes and managed accordingly. Most of the financial planners profile their clients in following five categories ranging from Very Aggressive to Very Conservative and then within that category, optimum allocation to different asset classes is given. Conclusion: Risk profiling is a very important part of financial planning. It plays a very important role in the construction of portfolio of every investor. Without completing your Risk Profiling process you cannot know your optimum risk level and what allocation should be given to different asset classes and as a result you cannot create a portfolio which is good for you. Many times I meet investors where there is need to take higher risk and also there is ability to take high risk but they have not taken the level of risk that they can take due to some or other reason or sometimes they don’t know about their allocation in different asset classes. Similarly sometimes I find clients who don’t have ability to take high risk have taken high exposure to asset classes which are very risky. So I would recommend investors to approach qualified financial planners and go through risk profiling process so that based on above three factors they should know optimum risk level for themselves and accordingly create their portfolio. Much of the current decline in oil price can be explained by recent demand-supply dynamics. Supply has risen sharply due to shale and tar sands oil production coming on line, return of Libyan and Iranian production, and new discoveries in Africa and elsewhere. On the other hand, demand has been constrained primarily by global economic weakness, and less so by increased fuel consumption efficiency. Here are three less discussed observations on the decline in oil price. 1. There is little to doubt why this time is different with the oil price cycle. History teaches us that oil price spikes are associated with a sharp rise in investments in wells and refineries. These investments take time to come on line, by which time the business cycle reverses, causing a supply glut and declining prices. Since their investment option value is exercised, new producers keep producing so as to cover their variable costs. But falling price in turn boosts consumption and economic output, as well as discourage investments in production capacity (which any ways take time to become operational). The combined effect of increasing demand and stagnant production (and prospects) is a return to rising prices. 2. Much has been made out of the dramatic increase in shale oil production in the US and its salutary effect on US manufacturing and the economy. Now that the momentum has turned, the sustainability of the shale oil exploration induced economic growth has become questionable. Apart from the commercial viability of shale oil at these prices (which is highly contentious and very difficult to estimate), new drilling projects and other investments are being scaled back or cancelled. The cumulative impact on US economy could be substantial, even if off-set by the consumer wealth effect and decreased production cost for non-oil businesses. 3. Finally, the falling oil prices present opportunities for emerging economies like India and Indonesia in both lowering current account deficits (CAD) and rolling back their massive energy subsidies. However, in India's case, there are formidable challenges to seizing these opportunities. Though India has already taken the first step by recently decontrolling diesel price, on top of the earlier decontrol of petrol price, there are doubts about its resolve to hold steady when prices recover. For example, the gains from the decontrol have been offset by the subsequent hike in excise duty on petrol and diesel and the decision to not pass it on to the consumers and let it be borne by the national oil companies. Further, instead of slowly lowering the subsidy by not reducing prices on the face of decline in global price, the government has preferred to pass on the down-side gains to the consumers. Similarly, hopes of lower CAD may be misplaced. The decline in oil import bill could be more than offset by increased gold (consequent to easing of the import controls) and other imports (as the economic growth picks up). Indeed, the CAD is already showing signs of widening.